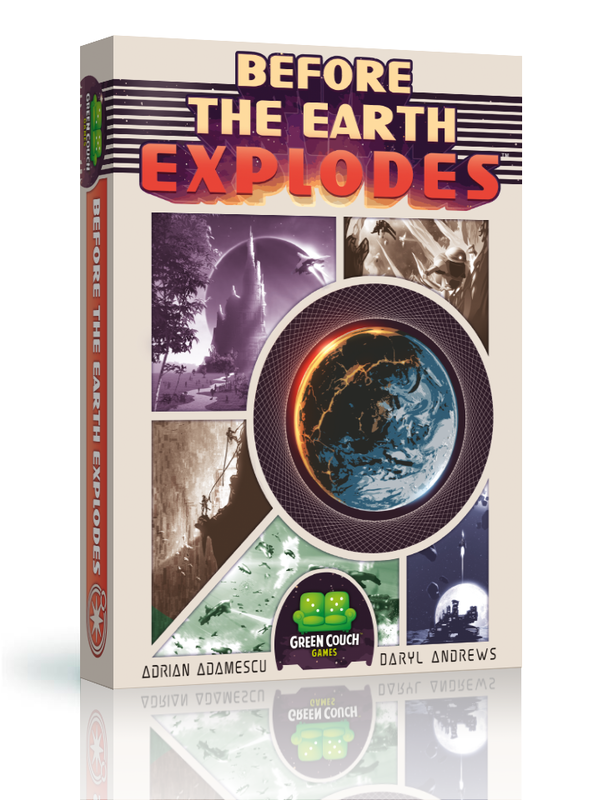 Before The Earth Explodes is a game that uses clever tactics and intuition to be the first player to advance to the top of the technology track, colonize 7 new planets, destroy the opposing faction, or meet a variable victory condition based on an encounter with an ally ship. In the game, players choose actions simultaneously to determine their course of play. Using a Rock-Paper-Scissors-style of action resolution, a scout will attack an invading ship while an invading ship will damage an away party or a mining vessel while a mining vessel will defend itself against a scout. If a player is able to avoid taking damage they will get to carry out special actions based on the card played. These actions allow players to increase their technology level, encounter an ally ship, clone an opponent's ability, take control of a new planet, or mine for resources. Before the Earth Explodes is 2-player space epic in a small package and each games takes 20-30 minutes to play. The game was created by the prolific design team and members of Game Artisans of Canada, Daryl Andrews and Adrian Adamescu (Sagrada, Mine All Mines, and the upcoming Teenage Mutant Ninja Turtles Showdown). The game will include 46 cards, 30 resource markers, and 4 player tokens. Art and graphic design is being provided by Davy Wagnarok whose love for retro sci-fi is helping to bring the game to life for the game table. Before the Earth Explodes will launch on Kickstarter in August of 2017 with plans for a Q1 2018 release.